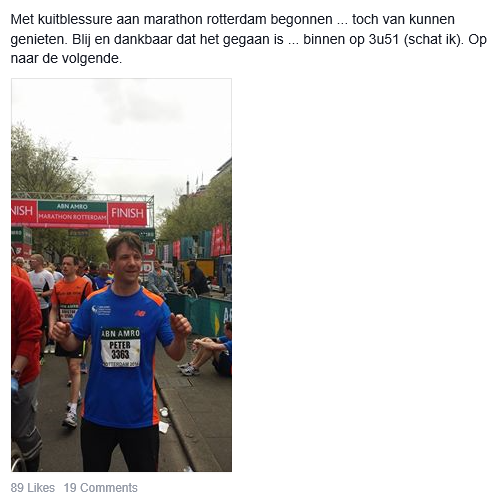 Training for the Rotterdam marathon didn’t go too well. On top of that, I got injured. Until the last moment before the race, I was in doubt: to start or not to start. About 20 minutes before the race, I decided to start. I was in Rotterdam anyway, and seeing the other runners warm up, removed all doubts. The race went OK but of course, not great. I enjoyed it, a lot, though. The Erasmusbrug was epic. The result was 3 hr 51, I knew I could do much better than that, but I was happy to have finished safe & sound. Question is of course: what went wrong, and did I treat this injury the right way ? No, not really. When you get injured, there are some basic rules. 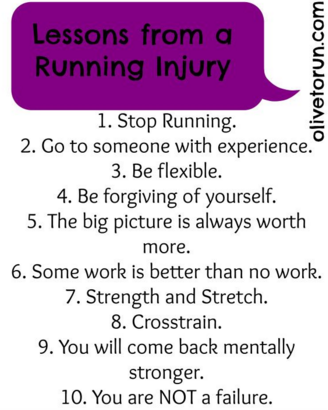 Stop running, take your time to recover, go see a doctor, do fysio if needed, get stronger by strength training, etc. : I did none of this. There are hundreds of guidelines with regards to managing your recovery. 99.9% of these guidelines, I didn’t adhere to. Number 8 : Crosstrain ? Nope. Number 4 : Be forgiving of yourself ? Absolutely not. As a result, I did not come back stronger, neither mentally, nor physically. I’m not sure why I didn’t follow the rules of the great Injuries book. Disappointment ? Perhaps. Perhaps dealing with an injury is as difficult as dealing with your regular training schedule when you are fit & healthy. Or, even more difficult ? Perhaps it’s also a matter of not being 100% respectful towards your body. 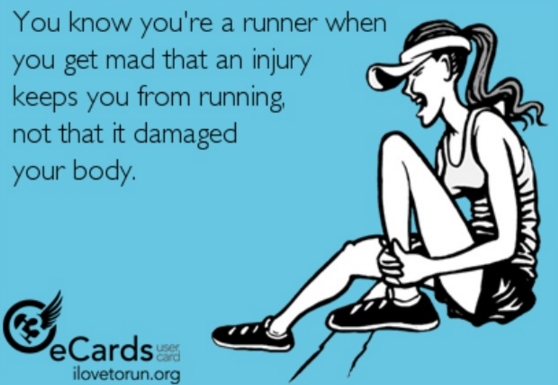 Actually, I was mad that the injury kept me from running, not that the injury damaged my body. When I think of it : that’s not really the baseline / road that takes you to swift recovery. Probably, injuries are there for a reason. First of all, because as a runner,you have actually caused the injury (over-doing it, etc. ), but second, because it’s a test how you deal with it. The lousy way (disappointment, not sticking to the basic rules that lead you to recovery) ? Or the patient, respectful way, which leads to swift & healthy recovery ? 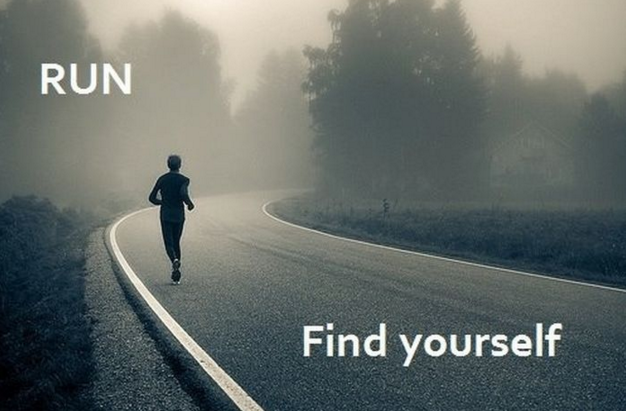 As with ALL aspects of running, recovering from an injury is a matter of finding yourself. Nowadays, I got a little bit better at recovering from injuries: I go see a doctor sooner, I don’t mind doing fysio if (really) needed, I try to stick to daily strength exercises, etc. : I guess I have made some improvements in this respect. But still, not there yet. Time to log off & shut down. Quick question: how do you deal with injuries ? Any great tips & tricks out there ? Can we have clean air in Brussels. Please ?